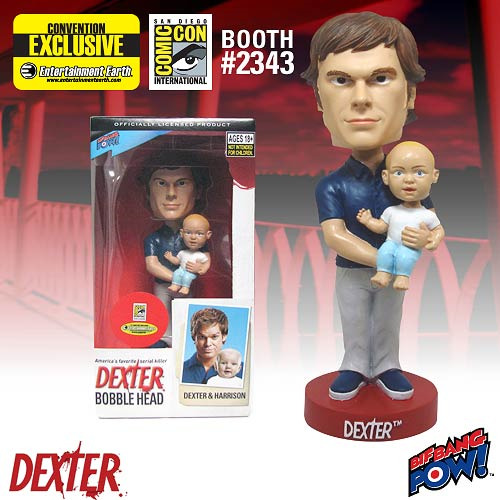 Shopping for Dexter Bobble Heads? Limited quantity of only 167 pieces! Just in time for the final episodes of Dexter. Both Dexter's and Harrison's heads bobble! Based on the hit Showtime television series. Manufactured by Bif Bang Pow! Can the serial killer and his son come over to your house? Entertainment Earth Comic-Con San Diego 2010 Exclusive! It's time to play daddy! From the hit Showtime television series Dexter, here's part-time serial killer Dexter holding little baby Harrison... and both of their heads bobble! A blood-spatter expert for the Miami Police Department by day, Dexter spends his nights murdering other serial killers. Now this so-called "good guy" – and his son – are available in this 7-inch resin bobble head!